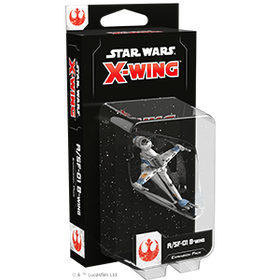 The A/SF-01 B-Wing Expansion Pack contains everything you need to add one of these powerful fighters to your Rebel squadrons, including a A/SF-01 B-wing ship miniature fully resculpted from the First Edition—now featuring folding wings, a spinning cockpit, and a body that can rotate on the peg. Additionally, you'll find four ship cards, identical to the A/SF-01 ship cards found in the Rebel Alliance Conversion Kit. Finally, you’ll also find reprints of eight upgrade cards and two new Quick Build cards that provide plenty of options for outfitting your B-wing for battle.